Economic news indicators are released every day for most developed countries. The more economically developed a country is,the more indicators exist to describe a state of its economy. G7 countries' news releases influence markets the most. The most popular forex currency pairs are traded versus the United States Dollar - USD (EURUSD, GBPUSD, USDJPY, USDCHF, AUDUSD, USDCAD, etc). It is the reason why the US economic news releases are so important and are so much analysed and studied. During a news release, a price may move up and down at 200-300 pips pace easily within minutes. It is more than important to know when such releases are published and what to expect. There are hundreds of indicators published. We have analysed the most important indicators to find out how this data influences forex prices. Further, you will find a list of available market analysis reports for purchase. The image below gives an overview example of how it looks like. 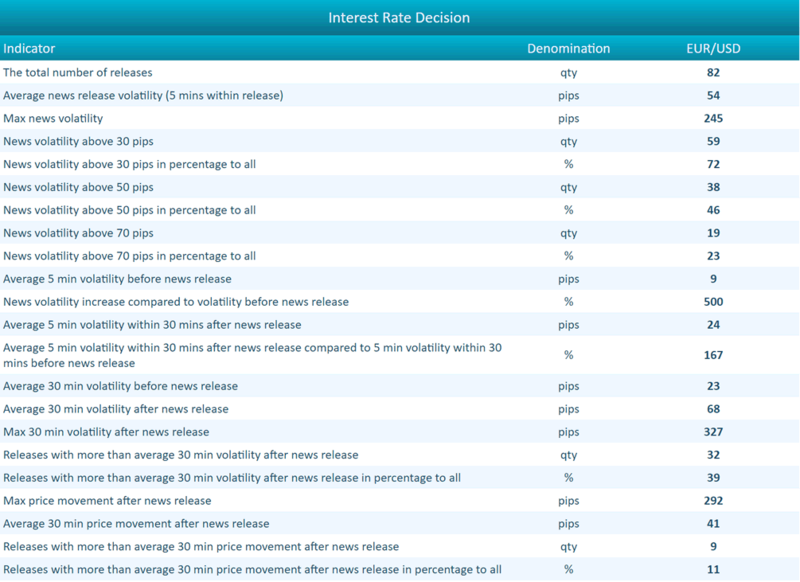 The example below is offered for the Feds Interest Rate Decision releases and their impacts on EUR / USD currency pair price. Presently we offer the most important US News indicators for the major currency pairs. The indicators include: Fed Chairman speeches, Fed Chairman Testimonies, Fed Monetary Policy statements, FOMC Economic Projects, FOMC Minutes, Fed Interest Rate Decisions, Non Farm Payrolls, Unemployment Rate, New Home Sales, ISM Manufacturing PMI, ISM Prices Paid, ISM Non-Manufacturing PMI, Durable Goods, Retail Sales (MoM), GDP QoQ, GDP Price Index, Labor Force Participation Rate, Durable Goods EX Transportation, Consumer Confidence, Retail Sales ex Autos (MoM), PCE (Personal Consumption Expenditures) Prices QoQ, CPI (Consumer Price Index) YoY, Core (Ex Food & Energy) CPI (Consumer Price Index) YoY, Michigan Consumer Sentiment Index, EIA Crude Oil Stocks Change. If you require a report for another desired country or an indicator not listed above, please contact us. Please use the following table to choose and to purchase your desired analysis reports. Upon request we may prepare a report for EU, UK, Japan, Australia / New Zealand, Canada, Switzerland, Germany and other countries with a corresponding list of news indicators. Please contact us for an individual report.